This Training is a perfect opportunity to significantly advance your debating and public speaking skills regardless of your current level. You may come only to those parts of the Training you prefer and be involved as an active participant or an observer. 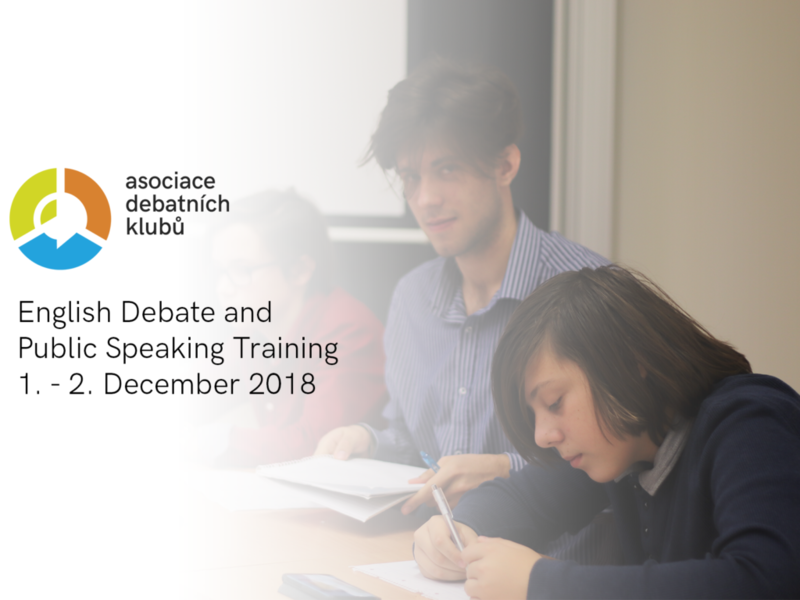 Always, you will train together with the current Czech National Debate Team and its head coach Richard Gracla as well as other experienced international trainers and judges such as Bedrich Bluma or Roman Uhlir. All are wholeheartedly invited. If you wish to come, please inform us by emailing the head coach at richard.gracla@debatovani.cz. Richard Gracla and Bedrich Bluma were on the Judging Panel and will share with you deeper insights into debating strategy and style. We recommend you watch the debate shortly before the Training and make detailed notes, so you can discuss the debate in depth. The art of delivery is extremely important not only in debating competitions, but also in real life. We will focus on essential as well as more nuanced elements of different speaking styles. You will have a chance to become either a Democratic or Republican representative on the Education and the Workforce Committee of the U.S. Congress. This will allow you to test your public speaking skills fully and benefit from feedback on your speaking style. The session will start with introduction to the the Rules of Procedure and the Motion to be discussed: ‘Reforming Education for the Future’. Participants are allowed to break for lunch (not provided by the organizers). The session will start with introduction to the the Rules of Procedure and the Motion to be discussed: Universal Basic Income, Robotization & Automation. This is a debate between the world champions in making (China won the World Schools Debate Championship straight after PDS) and a professionally trained team from Canada. As the Convener of PDS, Richard Gracla discussed this debate with the judges and will offer you unique perspectives into debate strategy, especially on highly abstract principle motions. We will revise and extend the most important elements in debate strategy and style in preparation for the following training debates. You may debate together with the members of the National Team, judge the debate, or just observe and learn, depending on your preferences. Motion: This House regrets the increasing focus on STEM education. This is the first of the prepared debate motions to be debated at the WHO international tournament in Zagreb this December. Also, it corresponds to the first Committee Simulation topic discussed on Saturday. Motion: This House would introduce a 100% inheritance tax. This is the second of the prepared debate motions to be debated at the WHO international tournament in Zagreb this December. Also, it is related to the second Committee Simulation topic discussed on Saturday.